Nathan Timothy Hafford, husband, father, son, brother, and nephew, went to be with the Lord, on Tuesday, September 4, 2018, with his family by his side. MARS HILL, Maine – Nathan Timothy Hafford, husband, father, son, brother, and nephew, went to be with the Lord, on Tuesday, September 4, 2018, with his family by his side. 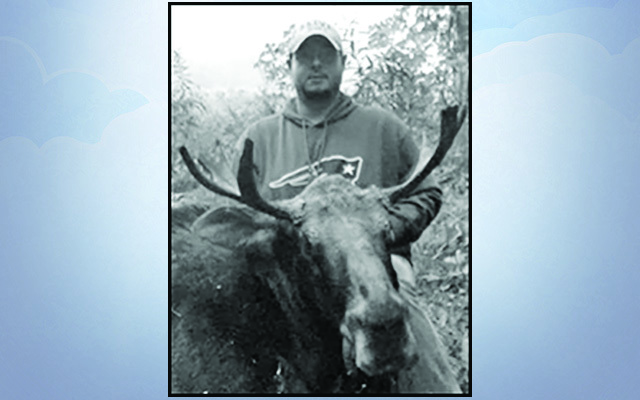 A native of Mars Hill, Nate attended Central Aroostook High School. The summer following High School Nate began his ten year employment with VIP, where he made many lifelong friends. Following his employment at VIP, Nate went on to work at Pineland where his list of close friends only continued to grow. Few things made Nate happier than fall trips to #9 or spending time at the Blue Door. When Nate wasn’t working, at #9, or the Blue Door, he was out hunting, fishing, or spending time with friends and family; unless, there was a Pat’s game going on, Nate preferred to watch those alone (with his phone off). Two men stood out above the rest in Nate’s life, Robert Lento, not only was his uncle, but his father figure and guide to manhood. Also, Wayne Giberson, his friend, brother, and partner in crime. Oh, the stories they would tell of their adventures. Nathan is survived by the true loves of his life, his wife, Katie and baby girl, Joanie; his parents, Scott of Vassalboro and Terri of Mars Hill; his father-in-law and mother-in-law, Hopper and Jean Henderson of Houlton; his sister, Heather Cecotti and wife, Angie, of Seattle, WA; brother, Sean and fiancée, Brittany of Presque Isle; brother, Thomas of Mars Hill; and sister and brother-in-law, Bonnie and Jacob Henderson of Houlton. He will also be missed by his nieces, Lilie, Kaydence, and Kassidy; his aunts and uncles, Robert and Shelly Lento, Raymond and Lisa Boone, Nicole Mullen, Kary Haley, and of course Uncle Joe, Lisa Hafford Garcelon and husband Rick, Kyle and partner, Veronica Mabe; many loving cousins; and countless close friends. He was predeceased by his Uncle Philip; Grandmother Cora Hafford; and Grandmother Joan Ames, whose world started and stopped with him. The family would like to thank the staff of TAMC for the loving and wonderful care that was given to Nate. Friends and family called on Saturday, September 8, 2018, from 1-2 p.m. at the Old Fashion Revival Center in Blaine, where a funeral service was held at 2 p.m. Memories and condolences may be expressed to the family at www.duncan-graves.com.